1. George Washington was a promotional marketer. The first recognized promotional products were used by our first president during his election campaign! Washington had commemorative imprinted buttons made, and while there were plenty of reasons he was America’s first choice for president, we like to think the buttons definitely contributed to his win. 2. Your clients and customers want to rep your brand. 8 out of 10 people report enjoying promotional products, and many even say they’d like to receive them more often, especially from the businesses they love! 3. Branded bags create the most impressions. Practical, reusable, and environmentally-friendly, shopping bags and tote bags are recipients’ favorite promotional products. Businesses also love bags because they’re easy to hand out and store in large quantities without breaking the budget! A close runner up to bags are the tried-and-true promotional pens. 4. Promotional products have a long, active life. Even if a promotional product isn’t exactly to a consumer’s personal taste, most people will pass along the product to someone who will make good use of it! This is good news, since your recipients will do the work of spreading your brand for you, heightening the likelihood that your products get into the hands of your target audience. 5. 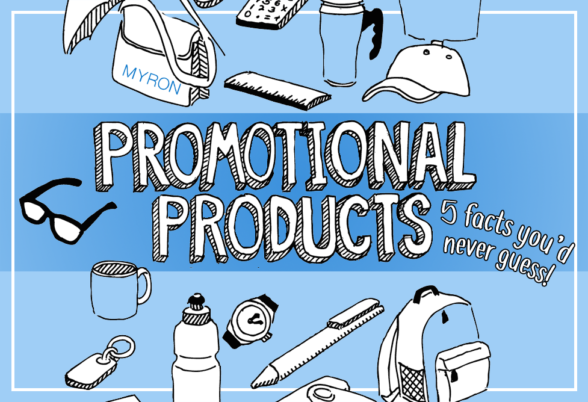 Promotional products can increase your marketing effectiveness by 44%. Adding a promotional product to your existing marketing strategy can significantly increase your reach. Tangible items help boost brand recognition, recall, and loyalty. People just tend to feel more strongly about brands that give them a free, useful item than they do about brands they only see in passing on social media. Are you ready to add promotional products to your marketing efforts? Let Myron help! With our 100% satisfaction guarantee, we promise we can find a promotional solution that works for your business!